Content marketing is one of the most prolific buzzwords in the market today. In fact, around 90 percent of organizations are engaged in content marketing today and most of those are investing more in it every year. Producing quality content is no longer an option; it is a must! Success in content marketing is only possible when the content reaches the right audience at the right time. The majority of buyers are no longer getting sellers involved in the initial discovery steps. This is the role telemarketing fills in placing quality content in the hands of qualified decision makers in real time. 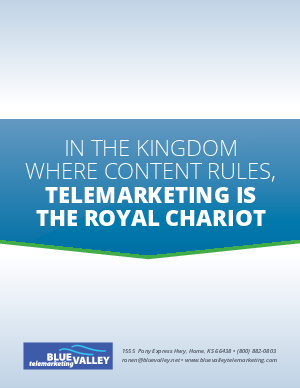 It is what makes telemarketing the Royal Chariot to support the kingdom where content rules.